It is the middle of the night. Off in the distance, a Northern Mockingbird is singing, belting out his repertoire of dozens of songs as if it were broad daylight. But no, it’s 2 a.m., and there’s no sign of his stopping. 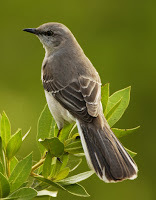 Some mockingbirds have been known to sing all night long. The same incredible album of tunes that is such cheerful music during the day seems almost haunting at night. Why the nachtmusik from a day-loving creature? Ornithologists have found that the midnight mockers are unmated males, apparently desperate to attract a female. Simply speaking, they are lonely and singing a birdworld version of the blues.